Who said that you need to have a barbeque grill in order to cook BBQ ribs? Have you heard about BBQ ribs cooked inside your home? This is done through the use of slow cooker. Yes, you still have your delicious BBQ ribs cooked perfectly without the need of going outdoors and using the barbeque grill. The best part of it all, it’s simple and quite easy to do. So, for the next dinner party or Christmas party you are planning to have prepared a sumptuous meal by cooking the good old fashioned and all-time favorite BBQ ribs. Just a word of precaution, when it comes to choosing the right pork ribs, you must check out the meat for yourself. Most of these ribs are wrapped and you can’t really check them out in the grocery. But if you want to buy fresh pork ribs, check out your local butchery if they may have something for your liking. Clean the ribs through rinsing them using tap water. Pat the ribs gently and put them inside the slow cooker. Get the onion and garlic. Chop them in small pieces. Then, add them right into the slow cooker together with the ribs. Slowly, start stirring the onions and the garlic to make sure that these cover the ribs perfectly. 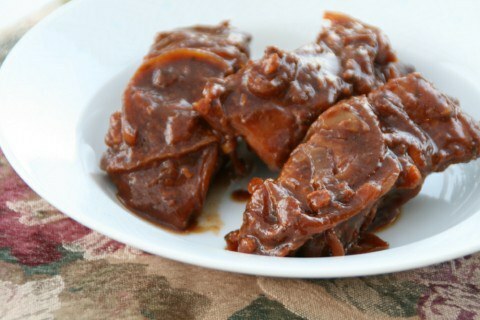 Then, get hold of the barbeque sauce and pour them right into the slow cooker. Put the temperature of the cooker on high mode. Cooking time for BBQ ribs will be approximately 2 hours on high temperature. After the lapse of the 2 hours, you need to lower down the temperature and the BBQ ribs be cooked for about 6 hours. Then, check the ribs if they are all done. You can check it through getting a meat thermometer and sticking it into the ribs. This will give you the internal temperature of the ribs. When the ribs reach your desired temperature, and then get them all out from the slow cooker. Place the cooked BBQ ribs on a platter and put vegetable side dish to give more color and flavor to the ribs too. Serve the ribs while they are all hot and juicy.